This post is sponsored by Wild Planet Foods. Thanks for supporting brands I use and love! 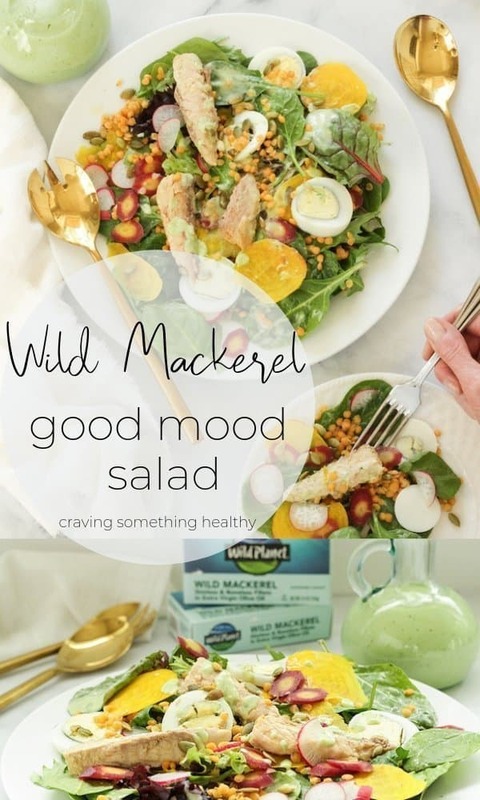 My Wild Mackerel Good Mood Salad is packed with foods that balance your hormones, lift your mood, and keep the winter blues away. 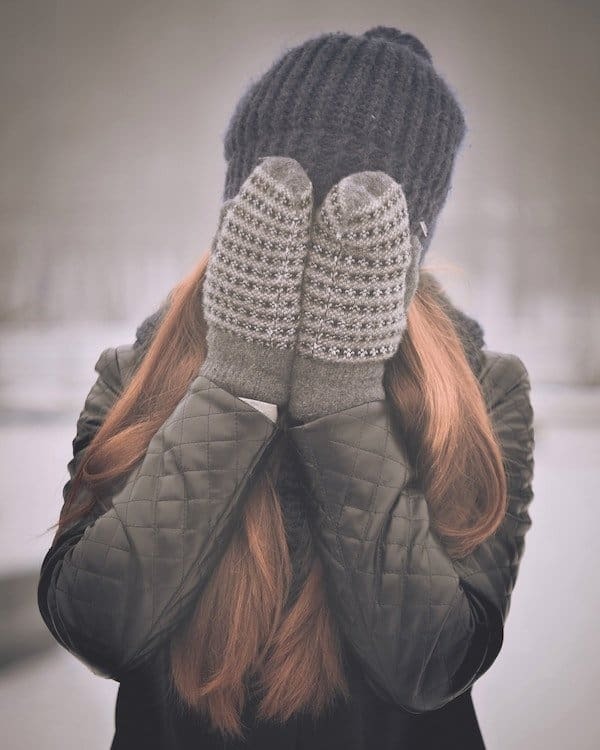 If it’s February, and you’re feeling out of sorts and not quite like yourself, you can probably blame it on the winter blues. It’s a real thing, caused by long winter nights and lack of sunshine. I consider myself an expert, because it’s what made me move from lovely but gray Boston to Scottsdale AZ, also known as the Valley of the Sun! Symptoms of the winter blues include sleep problems and lack of motivation. Plus, there’s that all-too-familiar craving for carbohydrate-rich comfort foods. 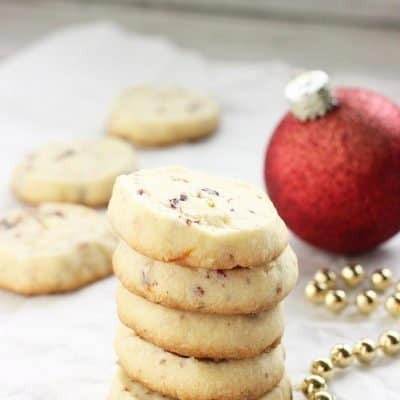 They do help to boost serotonin levels, but they also pack on the winter pounds and leave you feeling worse than ever. To combat the winter blues, you can skip town and take a long, sunny vacation. Or, there’s always the more drastic pack up and move… Or, you can just add more fish to your diet. It’s one of the easiest, least expensive, and tastiest ways to boost your mood. And there’s no packing required. Fish is always at the top of the list of Foods to Beat the Winter Blues, and there’s a reason for that. 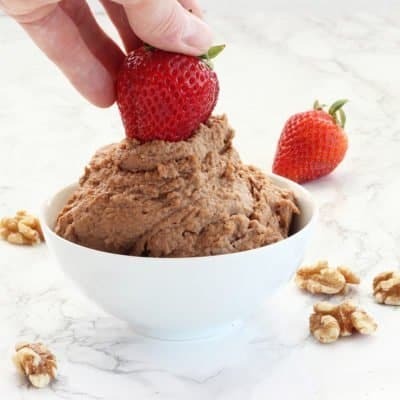 It’s full of protein which curbs that craving for carbs. Fatty fish like wild mackerel, salmon and sardines are excellent sources of omega-3 fats which help hormones and the neurotransmitters in your brain to work better. Oily fish also provides vitamin D, which most of us don’t get from the sun during the winter months. Fish really is brain food. The nutrients in fish help to stabilize our mood and improve brain function. Research shows people who consistently eat more fish tend to have better memory and cognitive skills, and less anxiety and depression. Even when it feels like winter will never end. Canned fish makes it so easy to meet the recommended goal of eating fish 2-times each week. It’s shelf-stable, so no running to the store in the snow! And, no cooking required. 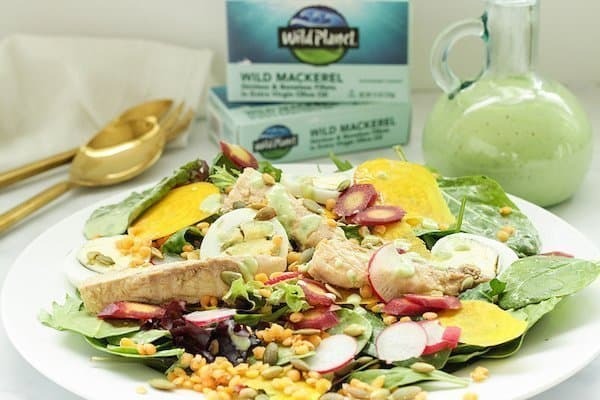 I love the quality of Wild Planet’s canned mackerel. It’s always wild-caught, not farm-raised. It’s also a super-abundant fish that’s sustainable caught in the Atlantic. Plus, mackerel is a low-mercury fish, so it’s a great choice for everyone, anytime. 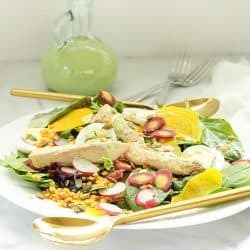 Wild mackerel tastes very much like fresh tuna, and it has a lovely texture, so you can serve the canned fillets right on top of this salad. If you’re not familiar with it, try something new today! 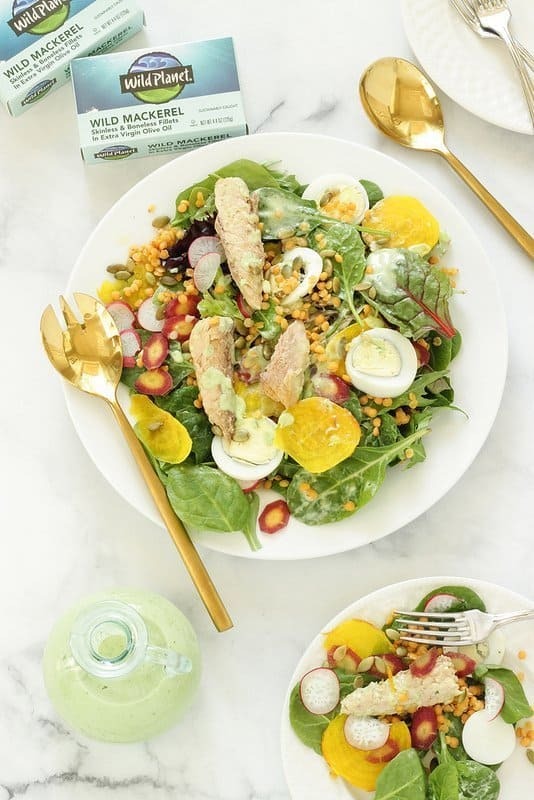 This salad is perfect for a lighter dinner, or make a big batch and enjoy it for lunch all week. 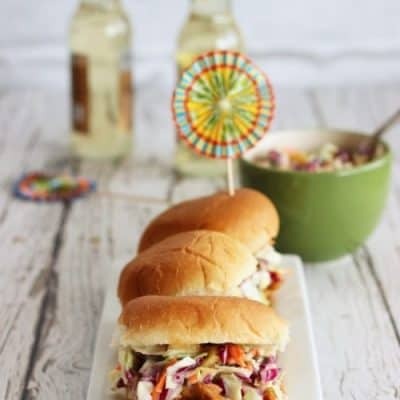 The bright colors and textures will make you smile, but it’s also jam-packed with mood-boosting ingredients. Red lentils provide long-lasting complex carbs that boost serotonin levels in your brain. Colorful baby greens, golden beets, radishes, and rainbow carrots fill you with cell-protecting antioxidants. Hard-boiled eggs give you an added dose of protein and vitamin D.
Avocado, sunflower seeds, and olive oil are the healthy fats that feed your brain cells, allow your body to absorb certain vitamins (like vitamin D, and fill and satisfy you. Kefir is full of probiotics that feed your gut and help stabilize your mood. and wild mackerel provides omega-3 fats that help your brain to work better, and lift your mood. 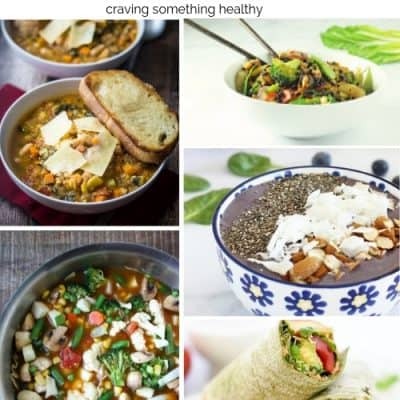 Eating more of these foods really will improve your mood, strengthen and nourish your body, and help you to roll into spring feeling leaner, lighter and so much happier. I’m happy to say I don’t get the winter blues anymore. I’m sure the sunshine helps, but I also eat more fish to seal the deal. Combine all of the dressing ingredients in a blender and blend until smooth and creamy. Taste and adjust any herbs or salt and pepper. 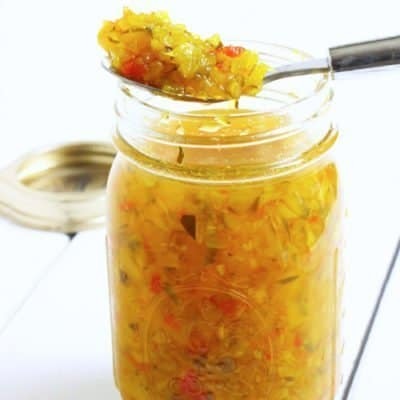 Pour the dressing into a jar or lidded container and store it in the refrigerator for up to 4 days. Combine the greens, beet, radish and carrot slices in a mixing bowl and toss to combine. Toss with about ¼ to ½ cup of the dressing (as desired). Sprinkle with the lentils and egg slices. Portion the salad on to 2 plates. 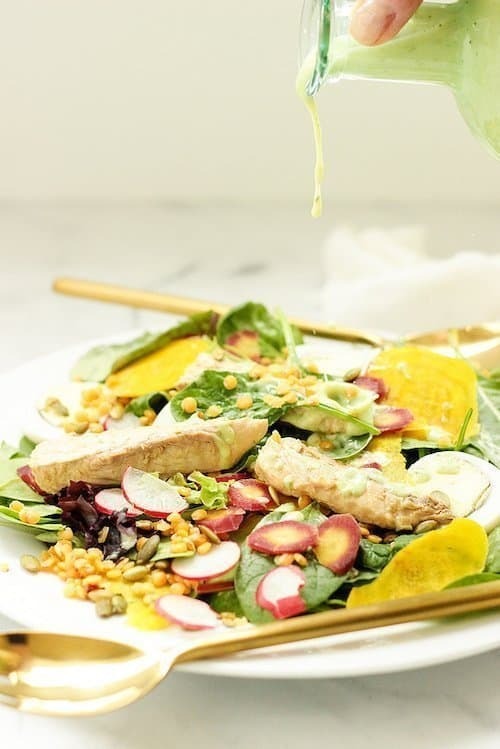 Sprinkle the sunflower seeds and top each salad with half of the wild mackerel. Serve immediately. If making this ahead of time, combine all of the salad ingredients but hold the dressing until just before serving. How is your winter going? Do you count down the days until spring, or just bundle up and enjoy the snow? What a beautiful salad! So nice to be able to use canned fish to create a healthy meal especially during these winter months. This salad sounds perfect. I haven’t tried mackerel, but have been meaning to include more fish in our diet. I can’t wait for spring and sunnier weather! It has been rather cold and dreary here on the East coast the last couple months!